If you would like to purchase any of the items below, please email, call us or stop by the Archives Building. We are currently accepting cash and checks and now PayPal! Order online and we will mail you your items! Second edition of Domestic Diversity by Lowell P. Beveridge, Jr.
"What a grand book. [It] cracks open a critical time in American history, and shows us through a personal lens what it was like to be at the very center of racial conflict, civil rights, and the mean end of McCarthyism in the early Fifties." 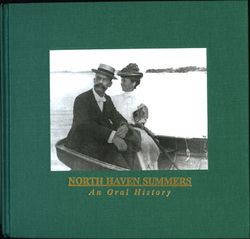 Eleanor Motley Richardson's Oral History of Summers on North Haven. The North Haven Bicentennial Committee takes great pride and pleasure in presenting this history digest. Considered to be a major accomplishment and fitting tribute to the Bicentennial Year of 1976. An incredible memoir by H.D.S. Greenway. Greenway spent over fifty eventful years as a war correspondent and journalist in the most dangerous spots across the globe. "Remembering things about Grandfather Orris and his times". By Lowell P. Beveridge, Jr. The stories behind the boat collection of the North Haven Historical Society, from early fishing days through North Haven dinghy races. Frank Benson Posters ON SALE $5! Unframed posters of Benson's Eleanor. Museum quality, approximately 2'x3'. Christina Abbott's Exhibit Catalog for our Summer Exhibit "Bartlett's Harbor Artists' Colony. Barbara Allen Benton's Illustrated Memories of North Haven. Compiled and edited by her daughter Christina Abbott.